Tempeh tacos are a great meal idea for Meatless Monday. 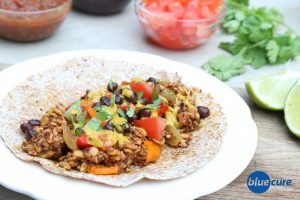 Use tempeh in place of chicken or beef for a plant-based protein in your favorite burrito recipe. Top it with raw veggies, cilantro, salsa, beans, and avocado— and even give our creamy, dairy-free Nacho Cheeze Sauce a try! Tempeh is a whole food, fermented soybean product that is high in protein and fiber. There is a lot of misinformation about soy on the internet, so be sure to stop by our “Food Page” specifically discussing the nutrition research about soy. Dice the peppers and onions. Sauté the onions and the peppers until desired texture. Set aside. Crumble the tempeh with either clean hands or a spatula. Add the tempeh to a pan and with ¼ cup water. Sauté the tempeh until the water has cooked off. In a bowl, combine the chili powder, cumin powder, garlic powder, paprika, parsley, crushed red pepper, black pepper, and ¼-½ cup water. Pour the spice mixture over the tempeh and allow to cook on medium-heat until the water has cooked off. Slice the avocado, and dice the tomatoes. Rinse the beans. Warm the tortilla shells. Layer the all ingredients on the tortilla shells. Top with fresh cilantro and salsa. Optional to also add our dairy-free, Nacho Cheeze Sauce.